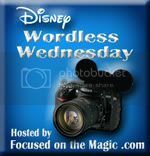 Disney Babies Blog: Wordless Wednesday - Parade! What a great shot! Captures Mickey and the theme of the parade beautifully! Your photo really captures the excitement of a parade! Gorgeous.....love seeing the mouse himself with the beautiful blue sky behind.